Europe’s ExoMars orbiter has begun its journey to the Red Planet on Monday with its launch from the Baikonur Cosmodrome atop a Russian Proton-M rocket. The first of two ExoMars missions, launch occurred on schedule at 15:31 local time (09:31 UTC) ahead of seven month journey to Mars. The Exobiology on Mars, or ExoMars, programme is a collaboration led by the European Space Agency (ESA) in partnership with the Russian national space agency, State Corporation Roskosmos. 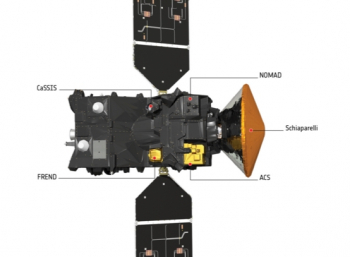 The programme consists of two spacecraft; the Trace Gas Orbiter (TGO) which is being carried aboard Monday’s launch, and a surface mission consisting of a lander and rover that are scheduled to launch in 2018. A third spacecraft, the Entry Demonstrator Module (EDM), or Schiaparelli, will be deployed from the Trace Gas Orbiter. 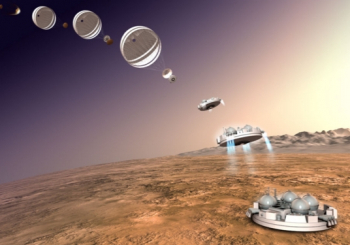 A technology demonstrator, Schiaparelli is intended to provide ESA and Roskosmos with experience or landing on Mars and test landing systems ahead of the landing mission. The aim of the ExoMars programme is to study Mars looking for evidence of current or past life on the planet. ESA also foresees the programme serving as a pathfinder for future missions that may return samples to Earth for analysis. ExoMars was originally envisaged as a flagship mission for ESA, under the agency’s Aurora programme, consisting solely of a rover. The orbiter component was added later. 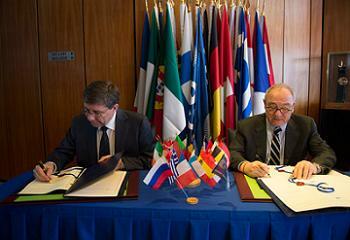 NASA became involved in the project, making it a joint venture between Europe and the United States, however it withdrew in 2011. Russia’s involvement in ExoMars came following NASA’s withdrawal from the programme. 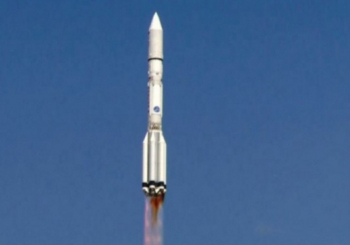 Russia will provide hardware for the landers and will conduct both launches using the Proton-M rocket. The Proton is the fourth different rocket that has been manifested to carry ExoMars – the spacecraft were originally expected to be launched by the Soyuz-STB rocket but mass increases forced it to move to an Ariane 5. It later switched to the Atlas V, before Proton was decided upon after Russia joined the programme. The rover mission will also launch atop a Proton. The ExoMars Trace Gas Orbiter carries a suite of four instruments to study the surface and atmosphere of Mars. The Nadir and Occultation for Mars Discovery, or NOMAD, payload consists of an ultraviolet spectrometer and a pair of infrared spectrometers which will be used to study the composition of the Martian atmosphere to a high degree of sensitivity. The Atmospheric Chemistry Suite, or ACS, consists of three further infrared spectrometers; ACS-NIR, ACS-MIR and ACS-TIR, which will be used to study the structure and photochemistry of the atmosphere by observing sunlight occulted by the atmosphere or reflected from the surface. ACS-NIR and MIR are Echelle spectrometers operating in the near and mid-infrared respectively. ACS-TIR is a two-channel Fourier spectrometer. The Colour and Stereo Surface Imaging System, or CaSSIS, is a high-resolution imager intended to provide both colour and stereoscopic images of the surface to allow comparisons to be drawn with data from the spectrometers and to provide context for measurements. The imager has a resolution of five metres (16 feet) per pixel. The Fine Resolution Epithermal Neutron Detector, or FREND, is a neutron detector which will be used to identify and map surface and subsurface hydrogen to a depth of one metre (3 feet). Studies of Mars’ atmosphere will allow scientists to draw conclusions about gases which may be by-products of potential life on the surface. The spectrometers allow the spacecraft to build a detailed profile of gases present in the atmosphere in trace amounts and record changes over time, which may be the result of seasonal variations or ongoing processes. One particular focus of the mission is methane, which has been intermittently observed in the atmosphere. Scientists believe that the intermittent nature of these observations suggests that the gas is still being produced and one of ExoMars’ key objectives is to determine whether a biological or geological process is responsible for this. The Schiaparelli lander will primarily serve as a technology demonstrator, and is only designed to function for four days before running out of power. Its batteries are not rechargeable, limiting the spacecraft’s lifespan. The Atmospheric Mars Entry and Landing Investigation and Analysis (AMELIA) instrument suite will collect data on the spacecraft’s trajectory and atmospheric conditions during descent, allowing a model of its entry conditions to be developed. 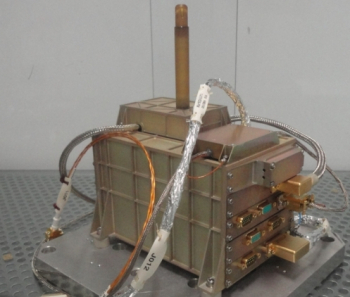 The Combined Aerothermal and Radiometer Sensors Instrument Package (COMARS+) consists of three sensor modules and a radiometer mounted on the aeroshell of the spacecraft. 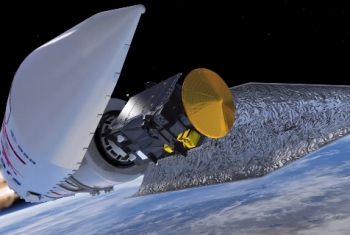 During descent it will record the pressure, temperature and heat flux acting upon the spacecraft. A Descent Camera, DECA, which was originally built as a flight spare monitoring camera for the Herschel astronomy satellite, will produce images of the landing site as Schiaparelli descends, allowing a three-dimensional topography to be established. On the surface, the Dust Characterisation, Risk Assessment, and Environment Analyser on the Martian Surface (DREAMS) experiment package will take readings of the temperature, pressure, humidity, wind velocity, atmospheric electrification and solar irradiance for as long as the batteries provide power. The Instrument for Landing – Roving Laser Retroreflector Investigations, or INRRI, is a laser retroreflector which will be used to allow spacecraft in orbit to make precise determinations of Schiaparelli’s location. Neither the European Space Agency nor Russia – or its predecessor the Soviet Union – have successfully operated a spacecraft on the surface of Mars. The Soviet Union came close in December 1971 when Mars 3 became the first spacecraft to perform a successful soft landing on Mars, however contact with the spacecraft was lost after less than fifteen seconds on the surface. Several other landing attempts during the Mars programme of the 1960s and 1970s met with even less success. Europe’s only previous attempt to land on Mars was with the Beagle 2 probe, which launched along with Mars Express in June 2003. 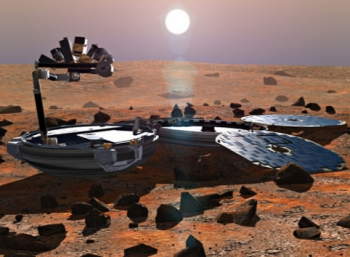 After separating from Mars Express, Beagle was scheduled to land on 25 December 2003, however following the landing no signals were ever received from the lander. The spacecraft’s fate was unknown until 2015 when it was identified in images taken by the Mars Reconnaissance Orbiter. Images showed that the spacecraft had landed successfully but failed to deploy its solar panels, which in turn prevented its communications antenna from being deployed. The Proton-M that launched the Trace Gas Orbiter is the Phase III Enhanced version of the Proton-M, and the rocket flew with a Briz-M upper stage. 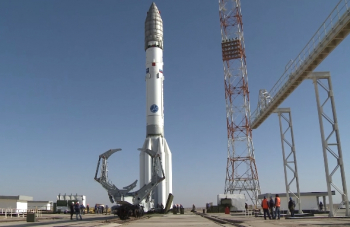 A workhorse of the commercial satellite industry, the Proton-M has been criticised for its poor reliability having suffered eleven launch failures or anomalous missions since 2006. The rocket’s most recent failure came in May last year when it failed to achieve orbit while carrying Mexico’s MEXSAT-1 communications satellite. The Proton is a three-stage rocket, although for most missions a fourth stage is added – either the Briz-M which was used for Monday’s launch or a Blok DM. Originally built as an intercontinental ballistic missile in the 1960s, the rocket was adapted to launch the Soviet Union’s largest satellites, which have included the Salyut and Mir space stations and the Zarya and Zvezda modules of the International Space Station. Proton was also used to launch many of the Soviet planetary missions, including the later Venera missions to Venus and most of the Mars probes. Protons also launched the Fobos 1 and 2 spacecraft in 1988, however a Zenit was used to deploy the ill-fated Fobos-Grunt spacecraft – Russia’s most recent attempt to send a spacecraft to Mars. 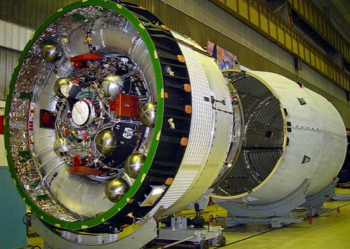 The country’s only previous attempt, Mars 96, was lost at launch due to a failure of the Blok D-2 upper stage of the Proton-K rocket that had deployed it. 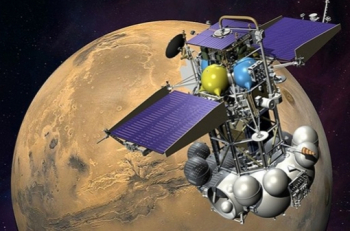 In 2003, a Russian Soyuz rocket successfully deployed Europe’s Mars Express spacecraft en route to Mars. The Proton launched from Baikonur’s Pad 39, which forms part of Site 200. One of two operational Proton launch pads, along with Pad 24 at Site 81, Pad 39 is typically used for commercial Proton launches. It was previously the launch site for the Fobos 1 and Mars 96 missions to Mars, as well as for the first module of the Mir space station. The Proton’s first stage is powered by six RD-276 engines, burning unsymmetrical dimethylhydrazine and dinitrogen tetroxide. This combination of toxic hypergolic propellants, though common in rocketry, has led to calls for the Proton to be withdrawn from service. 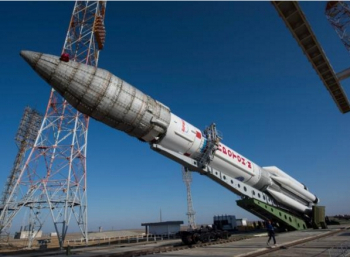 Proton is expected to be phased out once the new Angara rocket becomes fully operational. Following launch, the first stage burned for 119.7 seconds, with the vehicle passing through the area of maximum dynamic pressure 62.4 seconds after liftoff. As the first stage neared depletion, the second stage engines ignited while the stages are still attached, keeping the rocket constantly under thrust during staging. The second stage is powered by four RD-0210 engines, burning the same propellant combination as the first stage. Burning for three minutes and 27.5 seconds, the second stage continued to power ExoMars towards Earth orbit. At the end of second stage flight the third stage’s RD-0213 vernier engine ignited, followed after separation by the RD-0214 main engine. Collectively, these engines are designated an RD-0212. Nineteen and a half seconds into third stage flight, the rocket’s payload fairing separated from around ExoMars at the nose of the vehicle. Third stage separation occurred nine minutes and 41.9 seconds into the mission, with the main engine having cut off shortly beforehand. The vernier continued to burn up to separation, after which retrorockets fired to slow the depleted stage. Separating on a suborbital trajectory, the Briz-M upper stage ignited its S5.92 engine 94 seconds later for a four-and-a-half-minute burn that established an initial Low Earth parking orbit. This was the first of four burns from the Briz-M that progressively raised the apogee of ExoMars’ orbit until it escapes Earth’s gravity. Subsequent burns were made approximately one, four and ten hours later. Between the third and fourth burns the Briz-M’s toroidal propellant tank was jettisoned. 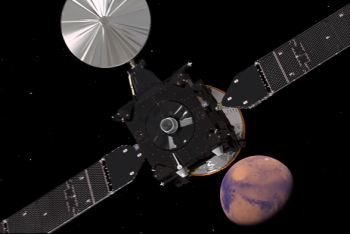 The final separation for ExoMars from the Briz-M occurred fourteen minutes after the final burn of the upper stage; over ten hours into the flight, with the spacecraft in heliocentric orbit. The first signals from the spacecraft were received at around 21:28 UTC by the Italian Space Agency facility in Malindi, Kenya. Monday’s mission was the first to heliocentric orbit for the Proton-M and the first for the Briz-M; Proton’s last planetary launch was of Mars 96 which used a Proton-K/D-2. The ExoMars Trace Gas Orbiter will begin a seven-month coast to Mars, arriving at the Red Planet on 19 October. Three days before arrival Schiaparelli will separate from the Trace Gas Orbiter in preparation for landing. The Trace Gas Orbiter is expected to remain in service until at least December 2022. 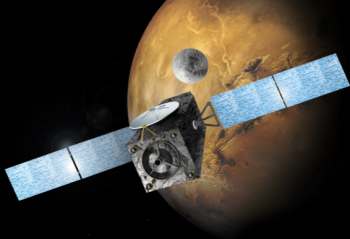 ExoMars joins a host of other spacecraft in operation at Mars; the oldest, NASA’s Mars Odyssey, was launched in 2001. ESA’s Mars Express, NASA’s Mars Reconnaissance Orbiter and MAVEN and India’s Mars Orbiter Mission are all still operating in orbit while NASA’s Opportunity and Curiosity rovers explore the surface. Monday’s launch was the second of 2016 for Russia’s Proton following January’s deployment of the Eutelsat 9B communications satellite. 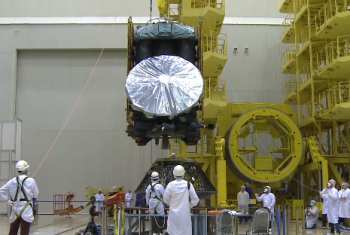 Proton’s next launch is expected to come towards the end of April, with the Intelsat 31 spacecraft.